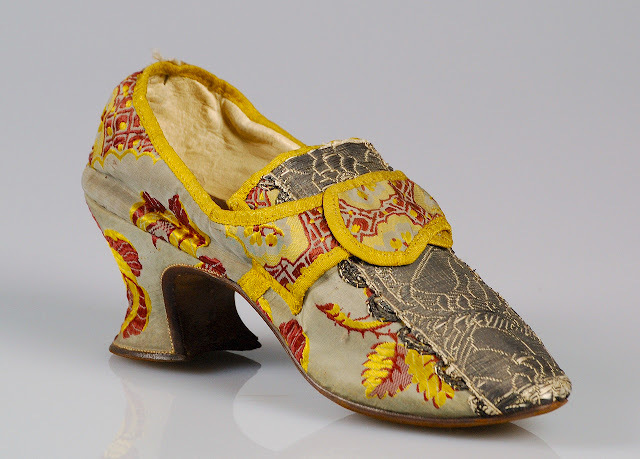 Bold and saucy (like Mistress Firebrand herself), the yellow and red shoes weren't everyone's cuppa, but just imagine if those shoes were decorated in your favorite colors, to match YOUR Georgian gown. It may seem complicated, even crazy, but I'm now going to show you exactly how to do it yourself. 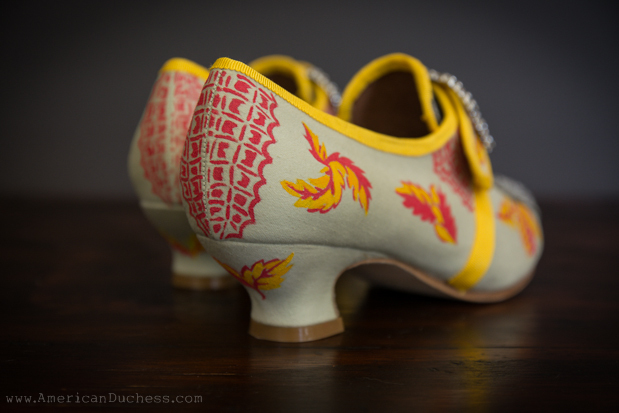 Lacing - wide trim for the vamp of the shoe - can be a wide ribbon or trim of any kind, preferably metallic. 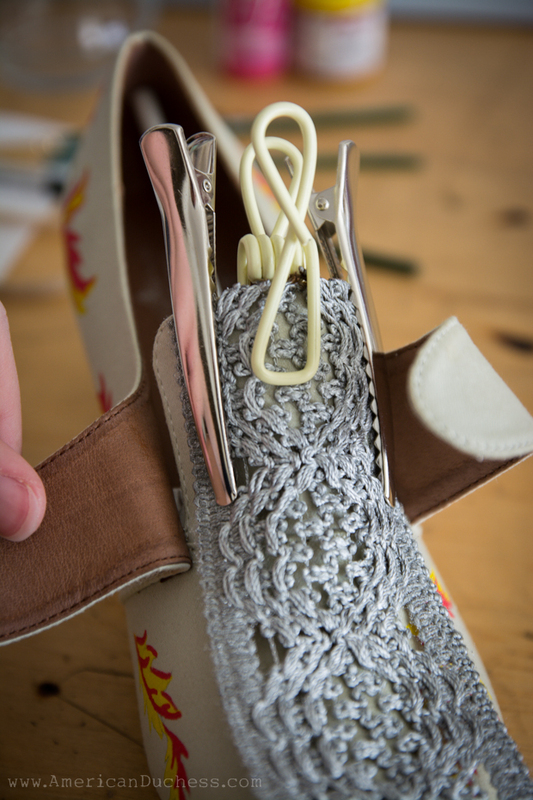 If you can't find metal lace or ribbon, use silver spray paint to "fake" it. Before we start, please know that you can do some of these techniques, all of these techniques, your own techniques, or no techniques at all (just leave them white!). I started by dyeing my Georgianas light grey, using International Fabric Shoe Dye in color A29. Once they were dry, I sprayed them with Scotchguard before I started painting the flowers or glueing the trim. For a basic dyeing how-to, check out the slate blue Georgianas in this tutorial. Then finished the pattern with the red fabric paint. The painting took the longest and was the most "skilled." 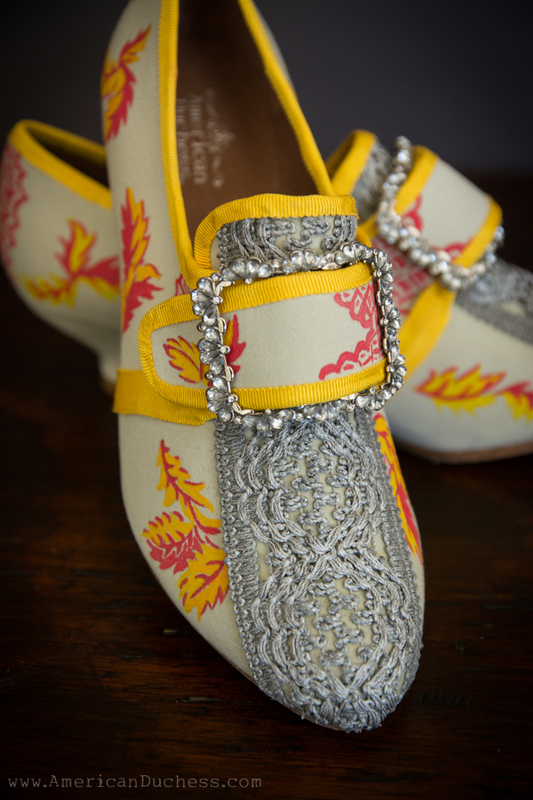 As an alternative to painting, you could applique pieces of brocaded fabric or even lace, similar to the vamp decoration on these Pompadours. 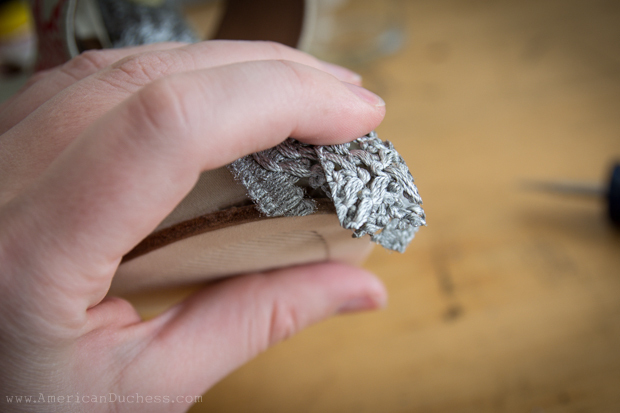 I "laced" the vamp of the shoe using a broad piece of jute trim. Originally this piece of trim was brown (you can see the backside in the photograph below), but I wanted a metallic lace effect similar to the inspiration shoes. The solution? Spray paint! To apply the lacing, I first separated the sole from the toe of the shoe. I used a heat gun (or hair dryer on hot setting) to soften the glue, then pried the sole away using a short flat-head screwdriver. 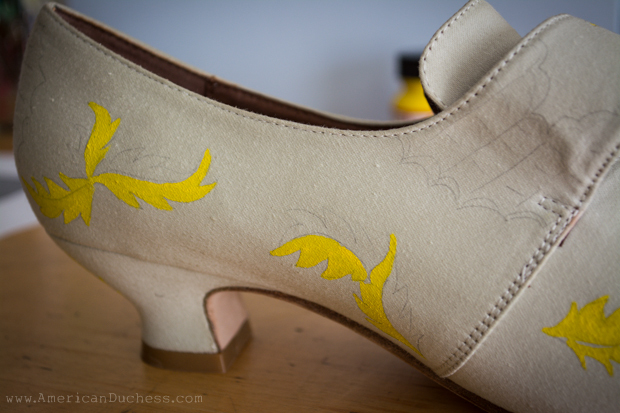 Next I covered the top of the shoe with fabric glue. 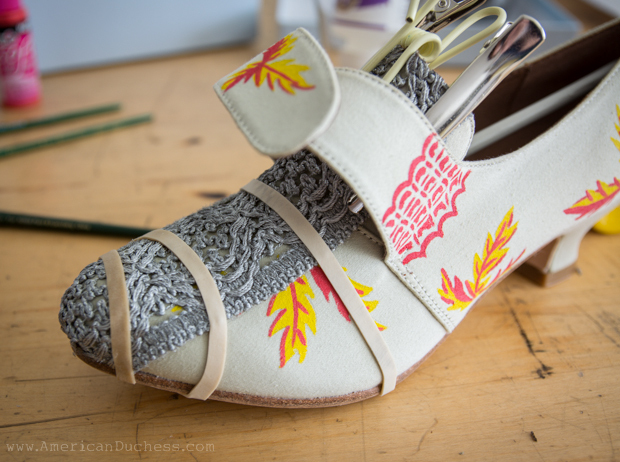 Use plenty of glue and spread it all around where the lace will go with the 1/2" flat paintbrush. Apply the lacing. Hold it in place while the glue begins to set. Rubber bands come in handy for this. 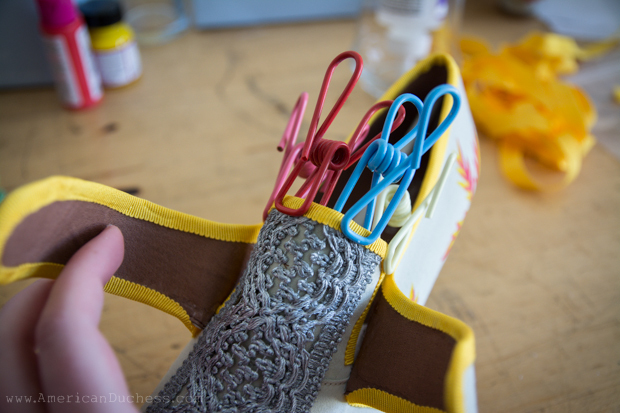 When you get to the toe area, trim the lacing and clip within so you can fold it cleanly around the toe. 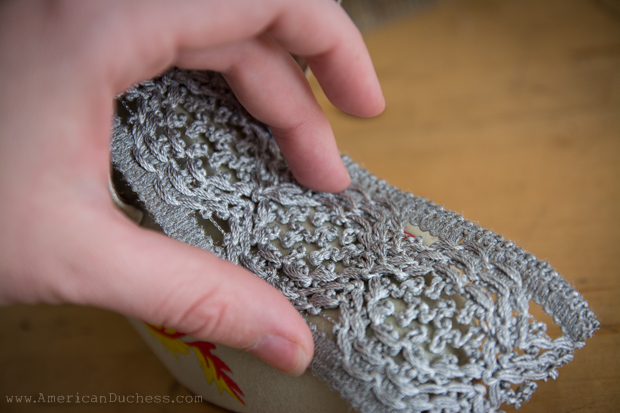 This can be a little tricky - an openwork ribbon trim or lace will make this easier, but go slowly and make only small clips until you can mold the ribbon around the toe. Now with the flat-head screwdriver, work the ends of the lacing between the sole and the upper. 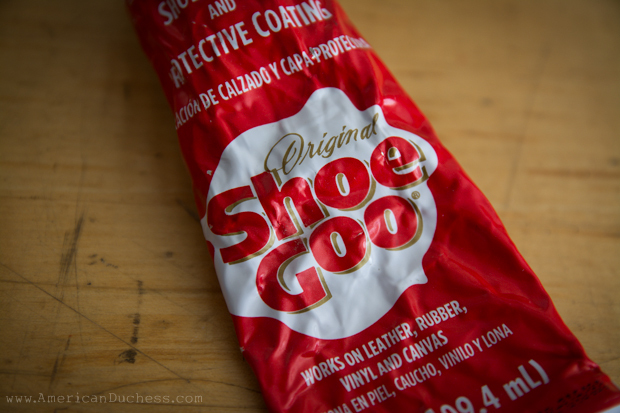 Using Shoe Goo, a shoe repair adhesive, and the flat-head screwdriver, work the lacing and the Shoe Goo in between the sole and the upper, and press the sole back into place as much as possible. Use the Shoe Goo to fill any gaps between sole and upper. 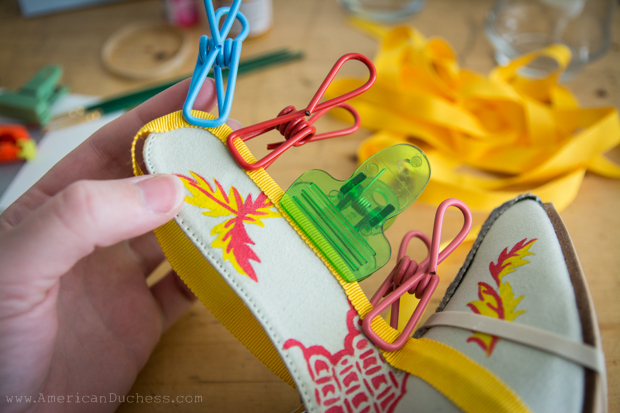 Use clips to hold the lacing in place while the glue sets. 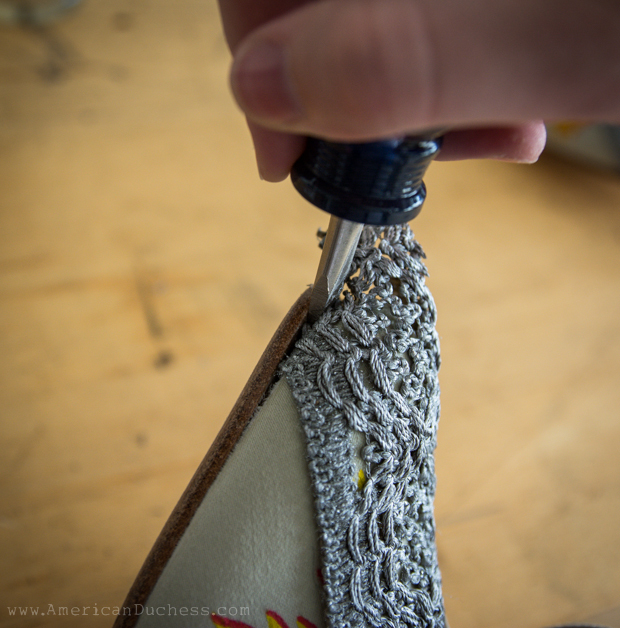 The top edge of the lace is cut flush with the top of the tongue. You will later cover this with petersham binding. 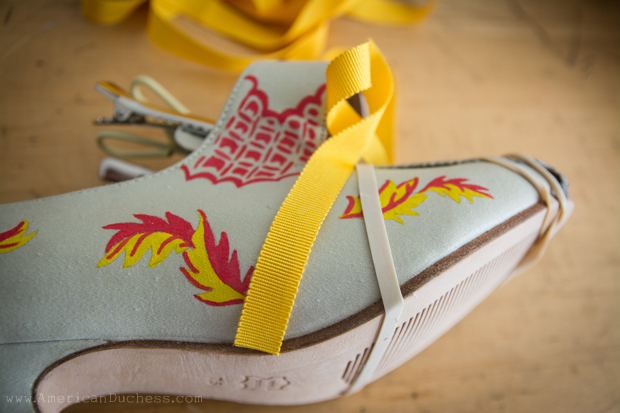 Use rubber bands to hold the lacing in place along the top of the shoe, while the glue sets. On original shoes the binding would have been stitched, but for this tutorial I have glued it. Squirt a line of the fabric glue along one side of the petersham, spreading it out thinly with the flat paintbrush. Go in sections about 4 - 6 " long at a time, starting from the bottom edge of one of the side seams, and work the petersham over the side seam, then folded over the edge of the latchets. Start at one side seam. It takes a little patience and a lot of clipping. I like to use pin curl or hair clips, but anything that doesn't have teeth or won't leave a mark on the petersham will do just fine. The trickiest part is working the petersham around the curve of the latchets. Stretch it, squish it, pull it taught - whatever works for you, bend it around the curve as smoothly as you can. 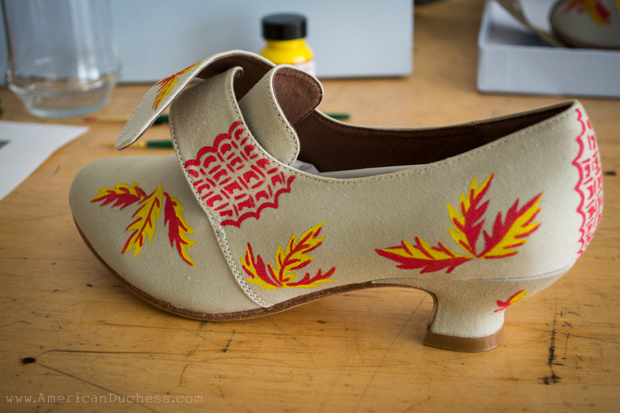 Spread the glue on the inside, fold over the edge of the shoe, and clip. Work the petersham around the curve of the latchet carefully. 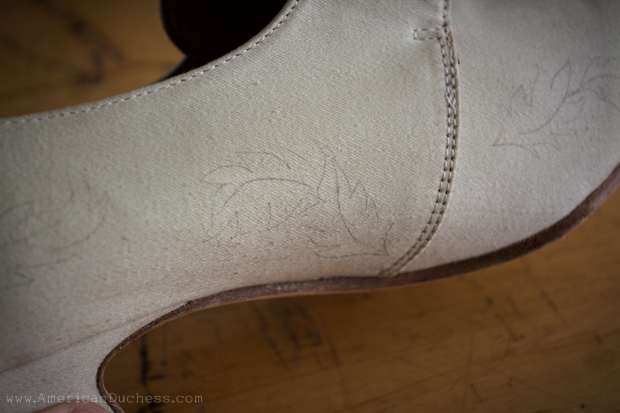 Going along this way, you will move completely around the shoe, from one side seam to the other. It takes time, so be patient and diligent. Once you have completed these edges, cover the tongue edge. Guess what? You're DONE! 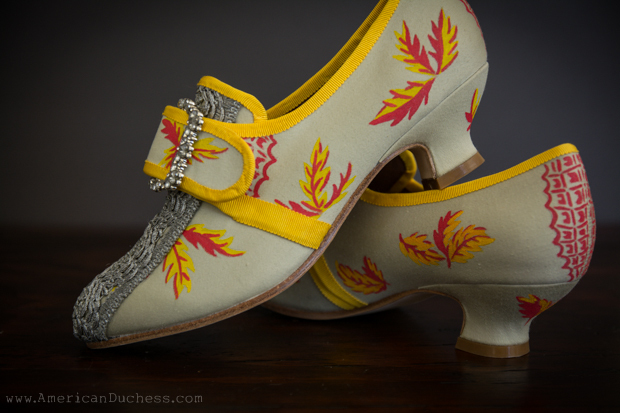 Affix your buckles and you're ready to wear your completely custom pair of 18th century shoes! What is holding the lappets down, one over the other, on the original shoe, if not a buckle?